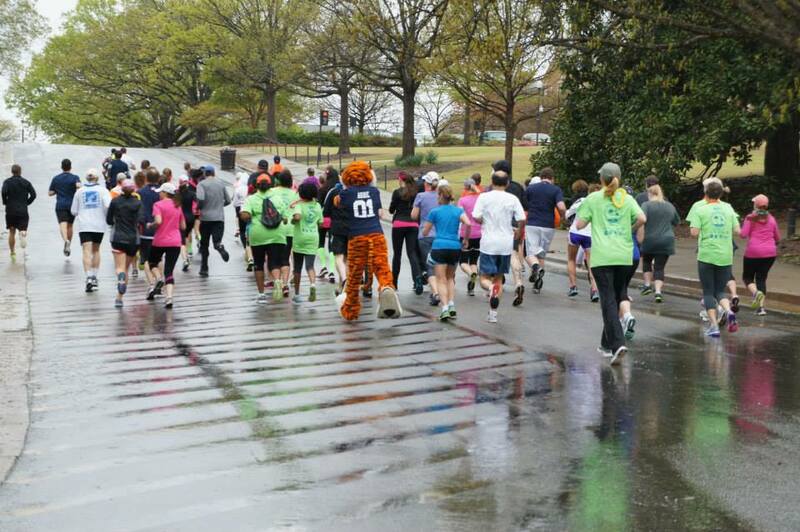 Two weeks ago I ran the first 5K I’ve done in over a year. 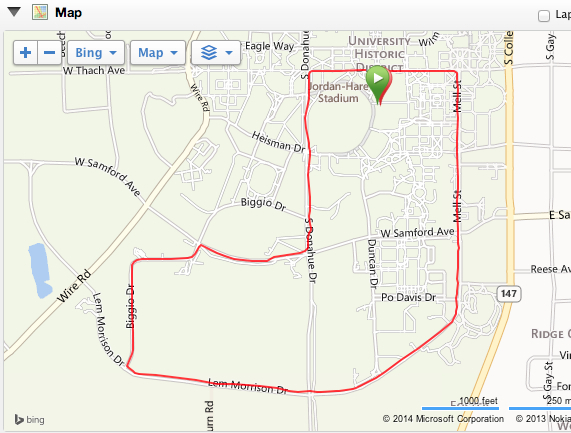 The last one I ran was a trail race, so this was the first road 5K in…well, I could look it up, but I’m too lazy. Let’s just say it’s been A GOOD WHILE. With injury recovery (and hence minimal speed workouts) and then running mainly distance races of 10 miles or more (last spring/fall), I have put speed on the back burner lately, so I didn’t really have a time goal for this race. My pace on training runs has been anywhere from 9:20-10:20, depending on the day, so in addition to not having a time goal, I didn’t even know what to expect in terms of my finish. A few friends of mine were running the race as well — one of whom was about 30 weeks pregnant at the time, and she ran so strong! 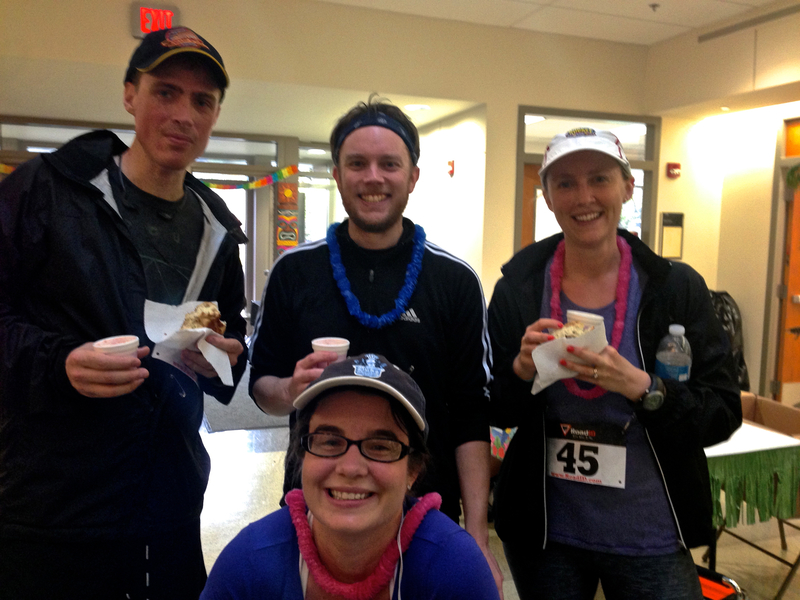 — and we hung around the registration area chatting and hoping the weather would calm down for the race. Luckily, it did, dying down to a light drizzle just before the start. I wound up ditching my jacket at the last second, which turned out to be a good decision, because by the time we were half a mile in, the rain had stopped completely. 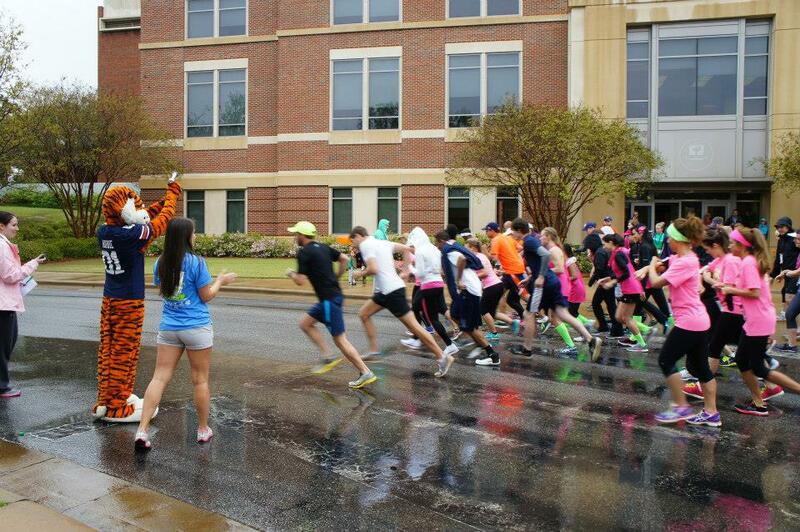 Aubie was there to start the race, and we took off for a loop around campus. My friends and I quickly lost sight of each other, with the fast guys out front, my pregnant friend farther back, and me in the middle. The run started out well enough– I always go out too fast, and this was no exception. Even though I could see the faster runners leaving me in their dust, and even though I actively tried not to race too hard, I saw a time of 8:55 when my Garmin beeped at mile one. I was pleased to see I could run ONE mile at a sub-9 pace (it’s been A GOOD WHILE since I’ve done that, too), but I was worried about keeping it up. Shortly after that mile, we hit the longest and steepest hill on the course at about 1.5 miles in. This was the moment when I wanted to slow to a walk — and a lot of folks did — but I managed to push through to the top. My pace for mile two dropped to about 9:36 because of that hill, but I was happy I persevered and, if I remember correctly, also passed a few people on it. The third mile took us back around through campus to the start, and by this point the runners were so spread out I felt fairly alone on the road. It was just me and my heinously heavy breathing, huffing and puffing up the gradual inclines. OK, this is a pointless negative thought that I’m about to explain, but I feel the need to put it out there: I often feel pretty self-conscious when I’m really burning it up on the run course, huffing and puffing and pumping my arms, face all violet and mouth hanging open in a desperate gasp — I’m a solidly mid-pack runner (I was 4-5 minutes slower than the winner in my age group, for example), so I sometimes feel like maybe it looks a little pathetic that I’m trying so hard to be mediocre. Like, hey, look at her, racing so hard for … no particular reason. Isn’t it adorable that she tries so hard? 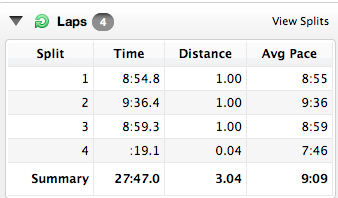 As I turned the last corner and saw the finish line ahead (passing by but barely able to acknowledge my cheering friend on the sideline, I was breathing so hard), I checked my watch and saw I was near my old 5K PR (from 2010, 26:36). I was too far from the finish to be able to make it, though– in fact, the finish looked deceptively closer than it was, and I made it in at 27:47, just over a minute slower than the old PR. We stuck around for age group awards and door prizes (I won an absolutely gigantic tee shirt from Max Fitness in the drawing). Can I just tell you how they did age group awards? In 18-25 and 26-35, they gave first, second, and third prizes. In 36-50 and 50+, they gave first prize only. Guess what I placed? 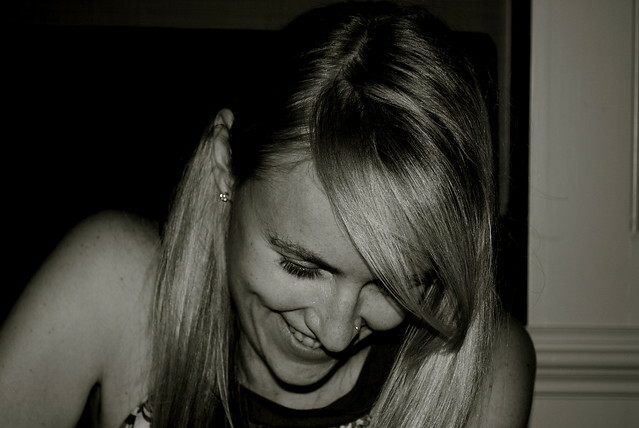 Second. In the 36-50 age group. Womp wommmmp. My friend Chase and I were sort of bummed that the prizes in our age group only went one deep even while other age groups went three deep– he was 2nd or 3rd for men in the same age group, so we both basically got robbed. Oh well! I guess there’s just no love for the second- and third-fastest middle-aged (I GUESS???) people at this 5K. Prizes aside, I still had a great time and I was so pleased at my race. This tells me that once I do start adding speed work back into my schedule (now that my hip is healed), I should be able to make some good gains.